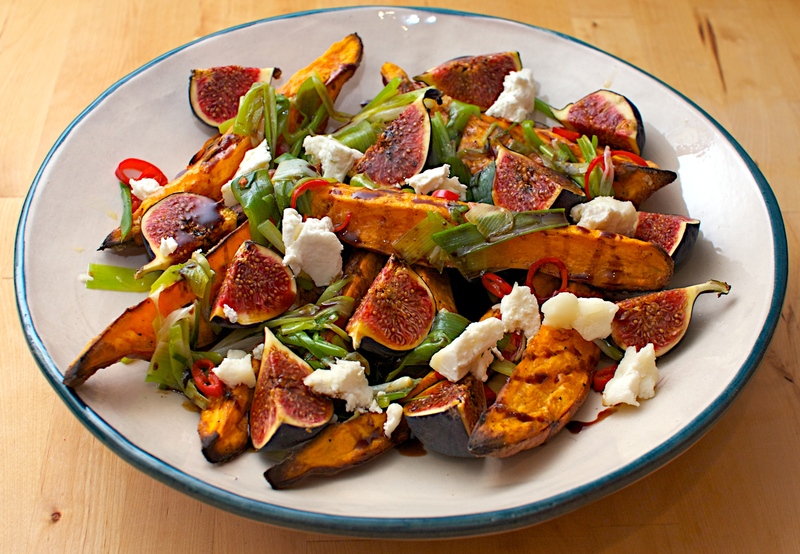 We made this when figs were in season and brought it to a friends house for lunch, then forgot about it. 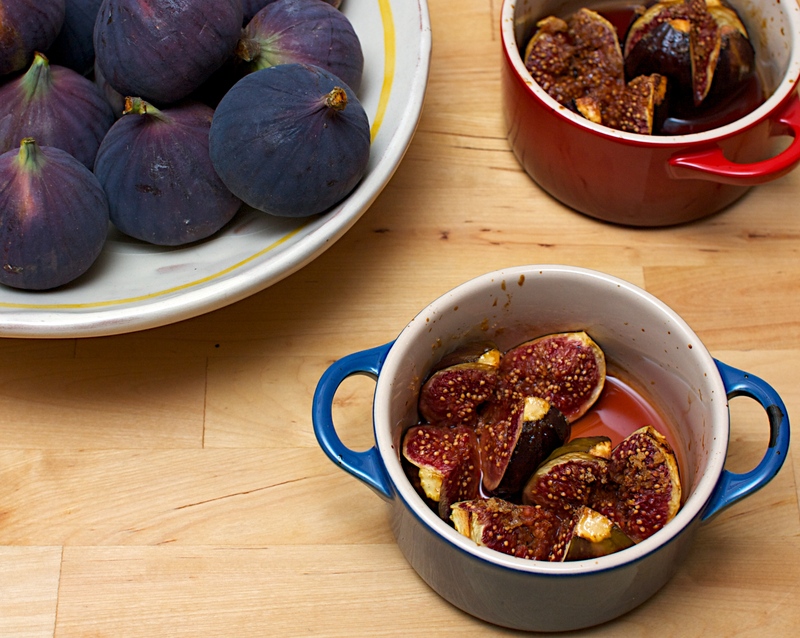 Here’s the recipe for the next time you find some fresh figs. Line the base of a loose-bottomed non-stick 20cm cake tin with baking parchment. Preheat the oven to 180°C/Gas 4. Beat the butter and sugar until light and fluffy. Pour boiling water over the almonds, drain with a spoon and remove the skins. Finely chop the almonds in a food processor or by hand, then add them, along with the ground almonds to the cake mix. Break the eggs into a small bowl, beat them lightly and add to the mix. Mix the polenta and baking powder together, then fold them into the mixture together with the grated orange zest and juice. Crush the cardamom pods and remove the tiny black seeds, then grind them to a fine powder with a pestle and mortar or spice grinder. Add to the cake mix. Cut the figs in half. Put half the cake mixture into the lined tin, add the figs, then add the rest of the cake mix and smooth the top level. Bake for 30 minutes, then turn the heat down to 160°C/Gas 3 and bake for a further 25-30 minutes or until the cake feels firm. Insert a metal skewer into the centre of the cake – if it comes out clean the cake is ready. To make the syrup , squeeze the orange and lemon juice into a stainless steel saucepan, bring to the boil and dissolve the honey in it. Keep at the boil for 4-5 minutes or until a thick syrup has formed. Poke holes in the top of the cake with a skewer, then spoon over the hot syrup. Leave until almost cool, then remove from the tin. 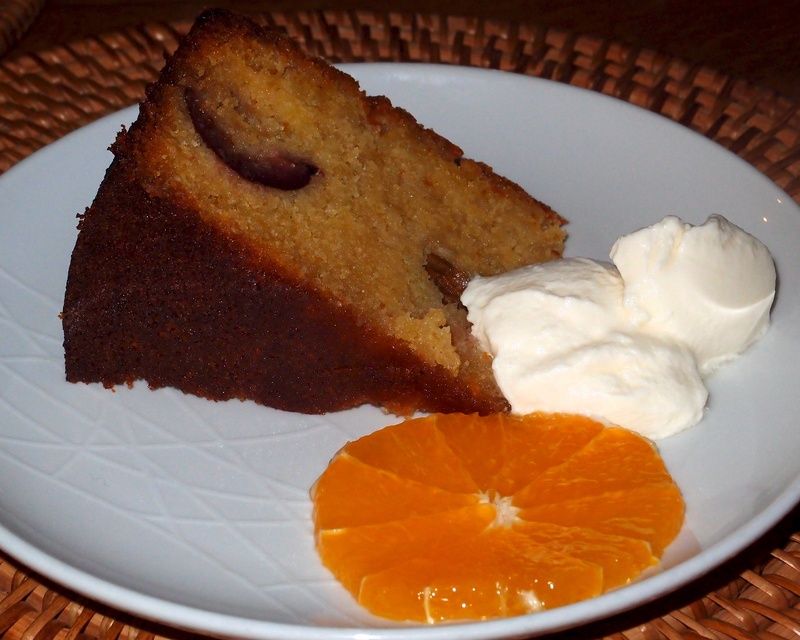 Serve with some thinly sliced oranges and natural yoghurt. Delicious served with a drizzle of cold cream. Cut the stalks off the figs, then slice a deep cross into the top, going about half way down. Push the fruit around the middle so it opens up like a flower. Place the figs in a baking dish (or individual pots) and sprinkle over the wine and a couple of tablespoons of sugar. Bake for 20-25 minutes or until very tender and the edges have started to caramelise. You can finish browning them under the grill if necessary. Serve with the sticky pan juices and a drizzle of cream. Our first recipe from Jerusalem by Yotam Ottolenghi and Sami Tamimi and also the very first recipe in this fabulous new book. We have a short window of opportunity at the moment when fresh figs are going cheap so we’re eating them with almost everything. This makes a great sharing plate. Preheat the oven to 240ºC/220ºC Fan/Gas Mark 9. Wash the sweet potatoes, halve them lengthways and cut each half into 3 long wedges. Mix with 3 tbsp of the olive oil, 2 tsp of sea salt and some black pepper. Place the wedges on a baking sheet, skin-side down, and bake for about 25 minutes, until soft but not mushy. Remove from the oven and leave to cool. Make a balsamic reduction by putting the balsamic vinegar and sugar into a small saucepan, bring to the boil, then reduce the heat and simmer for 2-4 minutes or until it thickens. Take the pan off the heat when the vinegar is still “runnier than honey” as it will continue to thicken as it cools. Stir in a drop of water before serving if it becomes too thick to drizzle. Arrange the sweet potatoes on a large plate. Heat the rest of the oil in a medium saucepan and add the scallions and chilli. Fry on a medium heat for 4-5 minutes, stirring, and then spoon the oil, onions and chilli over the sweet potatoes. Dot the figs among the wedges and then drizzle over the balsamic reduction. Serve at room temperature with the goat’s cheese crumbled over.